Hardy & Greys just announced a new line of fly rods that are 60% stronger and almost a third lighter than their previous carbon fiber products. The difference, says Hardy, is in the new fortified resin, which is filled with silica nanospheres. If the video of an angler fighting a 55-pound shark on a four-piece 7-weight is any evidence, these rods are plenty tough. Hardy says that the new technology will not mean in an increase in cost. “Prices should be comparable with other premium fly rod ranges,” they say in their press release. Hardy & Greys Ltd are proud to announce the most significant development in fishing rod design for twenty five years. 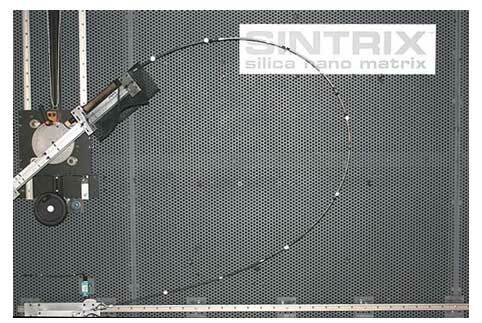 SINTRIX material provides rods which are 60% stronger, up to 30% lighter and with hugely improved impact resistance over conventional carbon fibre. Initially the new technology will be used in Hardy fly rods but eventually SINTRIX will also be used in Carp, Coarse and Sea ranges within the Greys and Chub brands. Decades ago when we moved away from cane and fiberglass, carbon fibre changed the way fishing rods were made. Carbon being remarkably strong for its weight gives us many advantages for modern rod design. The carbon rods we use today have of course advanced over the years but the trends for lighter and faster blanks lead to rods which can be brittle, unforgiving and prone to breakage during use. The carbon fibre in any fly rod blank is supported by a bed of resin, typically this resin or matrix simply holds the fibres in parallel alignment so that as the rod bends, the fibres can flex and return into position. However if a carbon rod is suddenly bent beyond its limits, the normal resins used in manufacture are unable to support the fibres adequately because the carbon fibres are stronger than the resin. The result is catastrophic failure due to the fibres buckling or, put simply, the rod breaks. These failures occur because typical modern fishing rod resins simply do not contain enough toughening mechanisms to give the fibres enough protection. SINTRIX is an enhanced fortified matrix resin which supports and bolsters the carbon fibres to withstand a far higher degree of bending and loading than ever before. Through technology, exclusive to Hardy & Greys Ltd, specially treated silica nano spheres are blended into a SINTRIX resin. Thousands of the nano spheres surround every individual carbon fibre giving a very even distribution of the particles throughout the resin which results in rods with unparalleled smooth casting actions. This technology is radically different to any previous nano rods using titanium nano or carbon nano tubes. These previous carbon nano technologies simply attempted to reinforce the carbon and not the all important resin. The bending strength of a SINTRIX fly rod is vastly improved over outdated common designs. Controlled testing has proven that SINTRIX fly rods are over 60% stronger and up to 30% lighter than previous carbon rods. A SINTRIX fly rod will bend further without damage and will also take incidental impacts far better than any conventional fly rod design. On a recent test trip to Florida five Hardy & Greys product developers caught around 1,000 fish on SINTRIX rods .The fish ranged from 5lbs to 350lbs and the idea was to put the SINTRIX blanks in situations above and beyond normal use. Despite their best efforts to test the rods to destruction our testers did not break a single SINTRIX rod! Some of this action is available to view on YouTube. Andy Mill, Hardy & Greys US based consultant and five time gold cup Tarpon tournament winner said about SINTRIX rods. Andy recently landed an 80lb Tarpon in just four minutes using a SINTRIX rod. Peter McLeod from Aardvark McLeod, International fly fishing specialists on the Hardy SINTRIX rods. “The perfect rods for the flats, I adored using them. They are light, responsive, have quick recovery, fantastic presentation and huge reserves of power. The blanks were so thin they just cut through the wind. Bottom line is these are without doubt the best rods I have ever used and when they go into production I will use nothing else”. Initial SINTRIX developments involve three Hardy fly rod ranges, one saltwater range and two freshwater ranges which will include double handed models. The new Hardy SINTRIX rods are set to be available in January 2011. In addition to these increases in performance and durability the company retains its commitment to using the highest quality fittings. This combination has not, however, resulted in a price increase which puts this material and its advantages out of reach to most consumers and prices should be comparable with other premium fly rod ranges. At Hardy & Greys Ltd. We believe that SINTRIX is THE new generation of carbon fibre technology and is the most significant breakthrough in rod development since the move from glass to carbon fibre twenty five years ago.